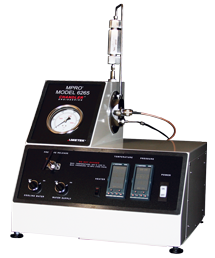 The Model 6265 Mechanical Properties Analyzer (MPRO) continuously measures the elastic mechanical properties (Poisson’s ratio, Young’s modulus, Bulk Modulus) and compressive strength of API cement as it cures under high-temperature and high-pressure conditions. These results enable the optimization of the cement’s formulation for long-term performance. Ultrasonic cement analyzers (UCA) are widely used to determine compressive strength during curing. The Model 6265 MPRO is a unique, specialized UCA that uses proven, proprietary ultrasonic analysis techniques to perform its measurements. The instrument’s single vessel curing technique preserves the sample conditions and testing integrity throughout the test thereby eliminating damage to the sample from handling or from unrealistic induced stresses caused by cooling and depressurization. The various acoustic measurements are read by an internal computer which automatically performs the numerous complex calculations. All test data including the mechanical property results are then transferred to a computer which is running Chandler’s Model 5270 Data Acquisition Software. The software produces real-time graphs of the test parameters and the measured mechanical properties. These graphs can be printed at any point during testing. All test data is recorded on the computer’s disk drive as the test progresses so that data is not lost in the event of a power failure. The Model 5270 software is capable of monitoring multiple Chandler Engineering instruments so only one computer is needed in the lab thereby saving valuable space.